Performance horses are kept in stables or barns at night where they are protected from the elements. Horses living on pasture need shelter from the sun in the summer and from strong winds, rain, hail and even snow in the winter, depending on where you live. All horses should have a three-sided shelter as a minimum requirement, and these walk-in sheds allow the horse to come and go as he pleases. You can buy a prefabricated kit or hire somebody to build your shelter, but the cheapest option is to build your own. Choose a level spot with good drainage so that it won’t be muddy and wet. Keep away from large trees that could crash down on the shelter in high winds. The open side should be on the side away from prevailing winds and should be easy to access and away from fence lines or rocky outcrops. If there is an existing building nearby consider utilizing that for one wall and make your shelter a lean-to structure, which requires less material. 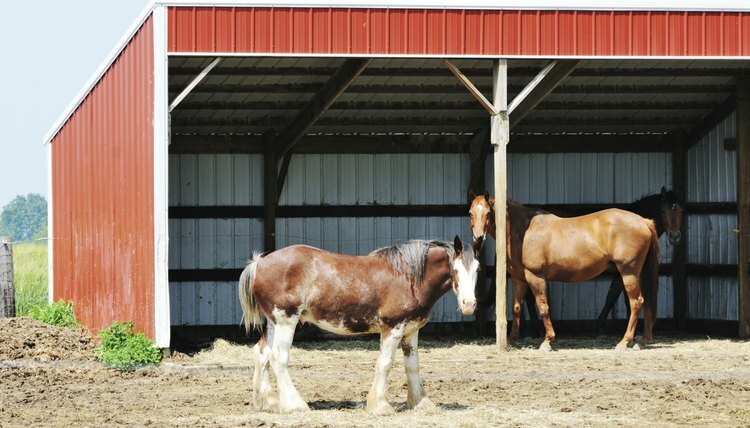 A one-horse shelter should be at least 12-by-12-foot, but if there is more than one horse in a paddock you should make a shelter large enough to accommodate them all. Size depends on the size of the horses or ponies and how well they get along, as an aggressive animal will chase others out. A rule of thumb is 240 square feet. or 12-by-20 feet, for two horses with an additional 60 square feet per extra horse. The height should be at least 10 feet to allow for a rearing horse, although for small ponies you could make it shorter. Standard depths are 12 to 16 foot, with deeper sheds for colder climates. You will need posts, sidings and a sloped roof to let the rain run off the back. You can use new or recycled materials and can build from stone, concrete, timber, metal or any combination of materials provided the shelter will be safe and sturdy. The poles for the frame should be strong and 4-by-4 as a minimum, although 4-by-6 is better. Round posts such as old telegraph poles are good. In addition to the four corner posts, you should have a post at least every 12 feet along the rear of the shelter. The rest of the frame can be 2-by-4 lumber. If you use metal siding, you should line the bottom four feet of the inside walls with plywood or heavy rubber so a kicking horse will not damage his legs. The roof should be 1 to 2 feet higher at the front than the back and metal is the cheapest roofing option. You can put a gutter along the back of the roof to direct rain water into a tank or trough. The posts must be set deep into the ground to provide a sturdy shelter that will stand up to strong winds and a horse who rubs. They should be set into the ground at least 2 feet and should be at least 6 inches below the frost line in northern areas, which means you may have to dig holes 6 feet deep. Ensure there are no protruding nails or bolts that could cause injury and do not leave any exposed metal edges. Painting the inside black will discourage flies in the summer. How Do I Convert a Garage Into a Stable?